I have now seen it all. 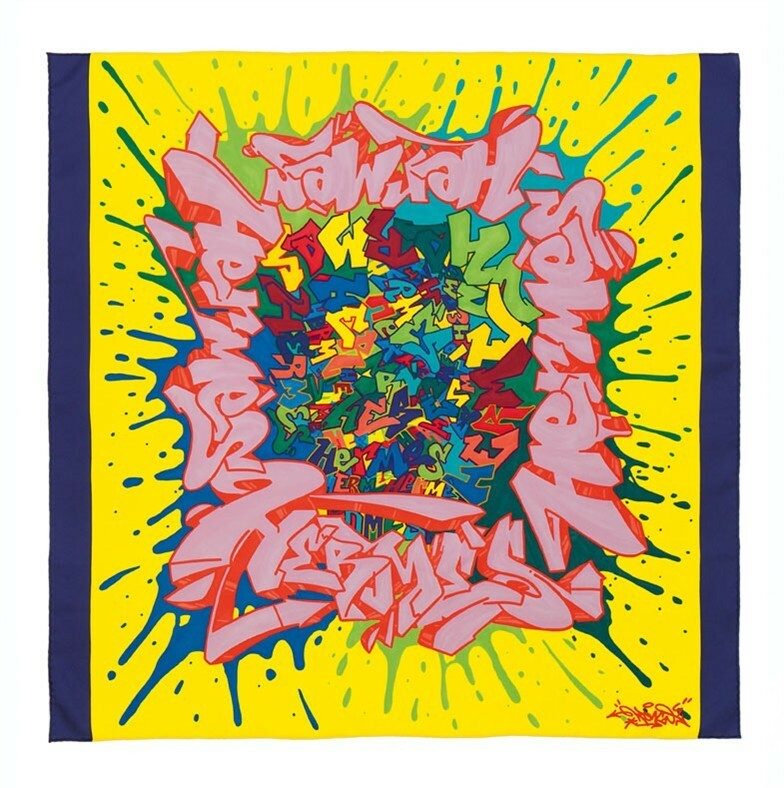 Venerable luxury brand Hermès has released a graffiti clad scarf as part of its Fall 2011 Collection. The line of scarves, designed by French street artist Kongo (aka Cyri Phan), are intended to play homage to urban culture. I am fascinated with this for two reasons: First, one of the books I’m currently reading is Michael Tonello’s “Bringing Home the Birkin”. The book tells the tale of the author’s wildly successful e-bay business venture as an Hermès Birkin broker whose business is bankrolled by selling vintage Hermès scarves. It’s a fascinating, almost unbelievable story that makes me repeatedly proclaim, “now why didn’t I think of that?”. Secondly, I wonder if this is street art’s “Jumping the Shark” moment. Do the actions of Hermès firmly plant this artistic medium into the cultural pantheon of society or is this merely a fashionable way for luxury seekers to define themselves as “edgy”? Let me fill you in on something about myself. Between fall and spring I wear a scarf nearly every day. I am an avid collector (albeit, not of the Hermès variety). So as a scarf (and handbag) enthusiast, I actually love this piece-the saturated colors are so vibrant and captivating, I would wear this in a heartbeat. As a fan of street art however, I am left a bit befuddled by this seemingly unholy alliance. So, I’m going to throw this one out to my fashionista followers. Hermès graffiti neckwear? Oui ou non? I’d love to know what you think! It’s like Murakami doing LV. I say more power to the artist who is able to capitalize on their art. Not that I’m a fashionista… I’m just not opposed to the concept of it all.